The idea behind ZuluTrade isn’t entirely new, but what is revolutionary is the delivery. ZuluTrade lets you pick and choose from a range of forex trading strategies, which can be used to build up profitable and diversified portfolios. The way this works is that you can “piggy back” the trades of some successful forex traders and can customize your trading parameters to meet your exact investment goals. The level of control you have with ZuluTrade helps in terms of management and manipulation of every aspect of the trade indicators you use. Trade indicators or signals as they are often called are provided by other, hopefully experienced traders. However, due diligence is needed because the system is essentially a survival of the fittest. Some signals can be entirely software generated, some are hybrid, while others are entirely manual. The traders may be supported by automated trading tools such as MetraTrader Expert Advisors. If using EAs, this is marked next to their strategy description. ZuluTrade, and it’s parent broker, AAAFX, doesn’t do any screening on your behalf. You won’t receive any guarantees regarding the qualifications or experience of your providers. Any trader can join the program and their signals are offered on an as is basis. They also don’t need to be trading with real money – they may be using demo accounts. That’s why ZuluTrade’s ranking system combined with the trading statistics is critical in the selection of your signals. Just like leverage, when used responsibly automated signals can amplify your investment returns. When misused they can quickly run up crippling loses. Signal providers are incentivized to produce positive monthly returns rather than just “churning” accounts to create commission. ZuluTrade isn’t itself a broker. It acts as a bridge. It provides trade execution instructions, from your signal provider to your broker. That way, your trade entries and exits replicate, as closely as possible the trades on your provider’s account. You should receive the same, or nearly the same profit or loss as your trader, proportional to your lot size. 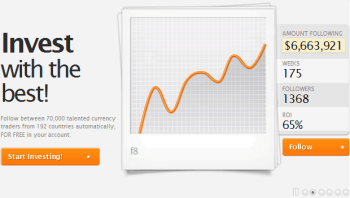 ZuluTrade works on a fee per trade basis. 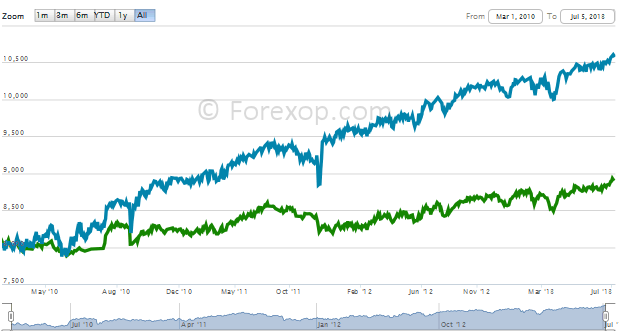 You pay 1.5 pips per lot traded, so this, together with your broker’s spread becomes your final cost per trade. From this fee, your signal provider receives up to 0.5 pips. However, they only get compensated for positive months. When their monthly P&L is negative, the signal provider isn’t compensated at all for that entire month. This means signal providers are highly incentivized to produce positive monthly returns rather than just “churning” accounts to create commission which is the case with some other copy trading programs. There’s a large amount of information available to help you choose signal providers on the platform. This includes the strategy description, trading statistics, ZuluTrade’s internal ranking system, and finally the user feedback. This will give you a quick insight to the performance of the signal, as well as the amount of risk being taken in proportion to the profits (see more). If the trader frequently has a large number of open trades (more than 7) as well as significant drawdown, this indicates high risk. In addition, look at the ratio of the best to worst trade. The lower this ratio, the more likely it is that the trader isn’t applying good risk-management. You can go into far more depth by looking at the data tabs on the provider’s page. Monthly performance – Checking the monthly performance (second tab) will show you a graph of the trader’s entire monthly P&L, showing positive and negative months. Look at the range of monthly performances in pips and compare this to other providers. It is better to see consistency rather than high, but erratic profits. But in the end it comes down to the amount of risk you are willing to take. Tip Another factor to consider is the trader’s market timing skills. To check this, download the trade history in Excel. Then add a new column which calculates the sum of the high/low value in pips of each trade. This measure tells you the level to which each closed trade was in profit or loss during the time it was open. Look carefully at the average over the lifetime of the signal. A highly negative value, after allowing for spread, tells you that the trades from the signal spend most of their time in the red. This isn’t to say the trader can’t be profitable. However it means his/her trade picking skills are probably no better than random. If the provider has already “burned out” a number of other accounts this raises a big red flag for me. It means that their profitability, if they are profitable, is arising from their exit timing. Having a large negative value can also mean the trader isn’t managing their downside risks properly, or is taking profits too early. In either case, it warrants further analysis as it may indicate deficiencies with the trader’s risk vs. reward. You can also use the downloaded data to calculate the Sharpe Ratio. This can be used as a “yard stick” for trader’s risk adjusted returns. Finally, another important indicator is the “also known as” section. This shows you any other signals that this provider has created – under his name. If the provider has already “burned out” a number of other accounts this raises a big red flag for me. While these checks aren’t exhaustive or infallible, they do provide an initial screen and basis for more in depth analysis. As well as checking the individual performance of providers, it’s a good idea to spread your risk across different trading styles. You wouldn’t want all of your signals to be trading exclusively EUR/USD for example. Most are day traders on ZuluTrade. Therefore having traders working in different time zones can be helpful and further spreads risk. This is especially useful if you’ve added limits on the total number of open lots on your account. It means some of your traders can be active during Asian market hours, while others can be active during European or US market hours. This spreads the load on your account throughout the entire day and reduces the chances of a margin call. Good money management should prevent you over extending your account. The amount of leverage you use is effectively decided by your lot sizes proportional to your account capital. So this is entirely under your control. With copy trading systems the amount you invest is fixed and you effectively “hand-off” all responsibility for management of those funds to the trader you’re copying. With ZuluTrade you can configure every element of the trade signal, customizing it to your account size and risk tolerance. Once committed, you have very little control. If things don’t go to plan the only option you have is to cancel the copy and claw back your funds or what remain of them. Block trading of commodities or risky exotic pairs – these are often highly volatile and trade with wide spreads. You can even reverse the signal. When you reverse the signal, buys becomes sells, and vice versa. Why would you want to do this? Research has shown that a significant number of traders perform worse than chance. The market drops exactly when they buy, and it rises when they sell. It can therefore be profitable to do exactly the opposite of what they do. Auto Mode If you don’t have the time or know-how to configure all of these settings, simply choose “automatic mode”. Then choose a risk setting using the slider bar and the rest will be done for you. The system will calculate the lot sizes for each of your providers by factoring in your account balance, leverage, and the number of signals you’ve selected. The simulation tool will give you an idea of how your account might perform. But be aware this is based on past data, and in no way is a prediction of future returns. It’s useful however to check if you’ve over-exposed your account and are at risk of a margin call. An important point to bear in mind is that with ZuluTrade, money management is your responsibility. The configuration of your trading signals needs to factor in your account balance, your leverage, your risk tolerance, and the amount of drawdown you’re willing to stand. The risk meter (margin call o meter), shown on your account page gives you a rough guide to the amount of risk your account is exposed to. This tool seems to underestimate the true risk. One critical factor is the choice of lot size. To start off, err on the side of caution. Whatever your account size, start by trading single micro lots (1 micro lot = 1/100 of a standard lot, which is equal 100,000 units of currency). If your broker doesn’t allow trading single micro lots, change to one who does. Tip A good rule of thumb for setting up your money management is as follows: Look at the monthly absolute returns in pips of each of your providers, and for each calculate the average over at least the last 6 months. Now add all of those numbers together! This figure will give you a good indication of the likely swings in your account balance during a typical month. Table 1: Signal returns: Example monthly returns v.s drawdown from 4 signals. This is simply a quick rule of thumb to see if your choice of signals is of the right order. Notice also, that except for “OS.PA. Long Term ST”, the drawdown is much bigger than the average monthly return. If you enter at a bad point, you could be waiting several months to recover your money. 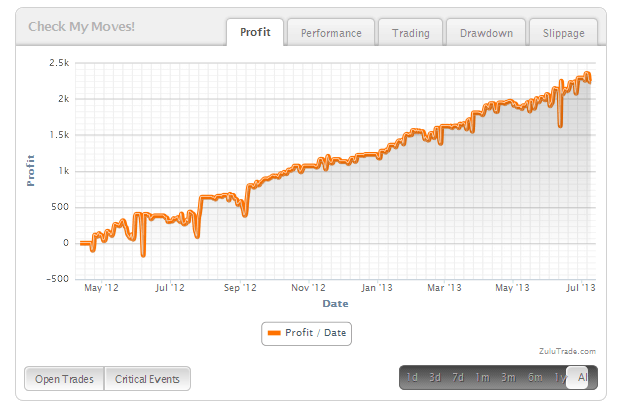 Remember if an aggressive signal can generate 4,000 pips in a single month, it can also lose at least that much. If the above check shows that more than +20% of your equity is exposed, it is risky. Those who’re trading on low margin and who want to maximize their leverage can, and do go much higher than this. But by doing this the chance of them being caught out with a margin call is extremely high. To protect your capital, ZuluTrade provides a handy tool called ZuluGuard. What this does is it lets you set the maximum drawdown you’re willing to accept from a provider’s signal. If the drawdown exceeds the amount you set here, it can automatically disable the trader and close all of his/her trades. It’s good practice to use ZuluGuard. Yet having it set too cautiously can cause profitable trades to close out prematurely. There’s a handy setting which just disables the trader, without closing any open positions. You’ll still receive close, and stop loss instructions on those trades. But the trader won’t be able to open any new ones. It’s also a good idea to use “safe mode” (in custom settings), and setup your own maximum stop losses. What this does, is it allows the trader to adjust stop losses, but only when they are more cautious than yours. The system will always take the settings with the lower risk. It’s worth keeping in mind that most signal providers don’t stay in the top spots for very long. All too often, their performance falls away and they start to trend back down to average, or well below average returns. We overestimate the performance of signals because we don’t see the thousands which have failed, stopped trading and moved into obscurity due to poor performance. There’s a well known effect in fund management called survivorship bias. This is worth bearing in mind here. We tend to overestimate the performance of signals in general because we don’t see those which have failed, stopped trading and moved into obscurity due to poor performance. This is why it’s important to setup proper controls and risk management when using these tools, and to regularly appraise their performance. On the other hand, constantly “switching and swapping” signals every time they have a minor setback can be equally harmful. As a follower, your number one job is to differentiate a genuine degradation in trend from normal trading noise. ZuluTrade is suitable for anyone who wants to invest in forex but doesn’t have the time or necessary skills to work with their own strategy. The amount of control and the fact that everything can be customized also makes it suitable for experienced traders who want to supplement or diversify their returns. The commission structure does tend to encourage short-term, high-volume trading. But on the plus, this can create rapid cash flows. With eToro on the other hand, you need to invest longer because traders tend to hold onto positions for a while – months to years in some cases. The pip amounts would not change but the amount each pip is worth depends on your account type (mini, standard etc). You can also set the lot size for any trader you follow. So if you have a standard account and follow a trader with 1 lot per trade say then each pip is worth about $10 (depending on the pair). In the profile about AAAFx should also be written that clients’ accounts are not segregated. Quite important , especially taking into account Greece condition. According to this broker’s own sales team: client accounts are segregated beyond the minimal margin requirement. So it depends on a) the size of your account and b) your use of margin. If you’re trading on high margin that’s effectively making use of borrowed money and so you wouldn’t expect much protection there. They also warn that even segregation does not guarantee full protection (this is in their full T&C). According to the broker, their deposit accounts are with RBS (Royal Bank Scotland) which would not be exposed to any Greek financial collapse one would hope. So it is a case of using your own judgement. I have traded with Zulutrade and their service is quite exceptional. As the Steve Connell said, most big bokers don’t allow Zulutrade and i don’t know why. Recently hotforex closed down zulutrade due to unknown reasons. Traders will now be careful before selecting \ulutrade as a signal provider. The thing I have noted is that you can actually get good profits using Zulu Trade even without being an experienced trader. I have used services from signal providers who are very expensive yet good performance is not guaranteed. In this Zulu Trade case, I like it that during the months that one doesn’t make any profits, one does not pay anything for the signals. My question to the author would be whether this Zulu Trade can be used by any Forex traders irrespective of the broker that they trade with or are there a specific number of brokers that accept Zulu Trade? Otherwise thank you for the information in this article. Most of the bigger brokers will let you connect up your account. To see the full list just go to the Zulutrade setup page and you’ll see the full list of the brokers you can use. 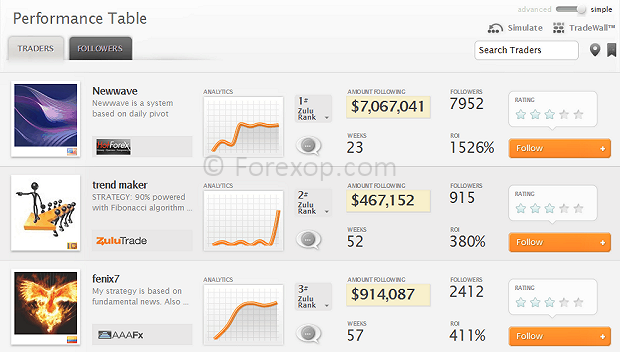 That page will also let you compare and filter based on different spreads, different account facilities and so on. Right now, the best rate, as you would expect, is with their own in-house broker “AAA Forex”. Triple A doesn’t apply an additional “fee spread” as do the other external brokers. They also have the fastest execution and lowest slippage because the system is fully integrated with the platform. The broker is EU regulated (MiFID) and based in Greece.